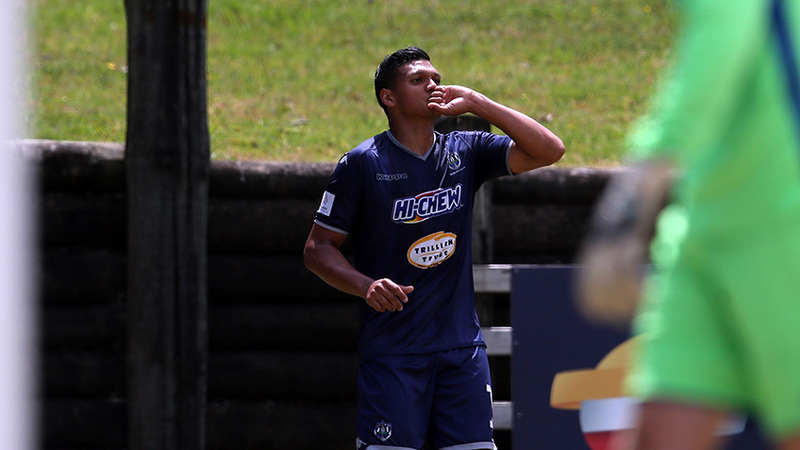 AUCKLAND, New Zealand - Navy Blues striker Ryan De Vries pays tribute to his team-mates following 3-1 win over Tasman United. The 26-year-old forward bagged a brace to take his personal tally for the season into double figures but he said without a tough reaction by the Navy Blues there would be no victory. "Its always tough coming back from FIFA Club World Cup and come back to playing in the ISPS Handa Premiership but we did that well. The Navy Blues closest rivals Team Wellington stumbled to a 0-0 draw with resurgent Southern United a result that opens up a two point gap between last season's grand finalists. De Vries was delighted to see the Navy Blues return to goalscoring ways after drawing a blank in Al Ain in the loss to Al Jazira on December 6. "The three goals we scored were great but we played well from back to front and it was a great team performance given where we were over a week ago," he said. The Navy Blues next ISPS Handa Premiership match is scheduled for Sunday 7 January 2018 at Kiwitea Street when they take on Waitakere United in the latest Super City derby.